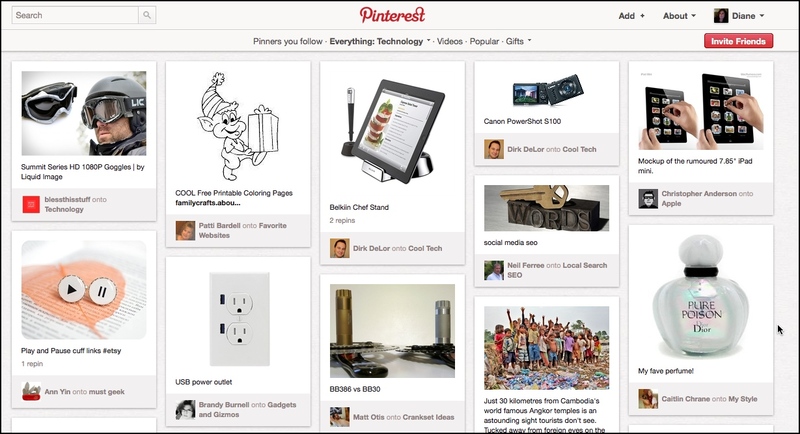 Pinterest is a social network that launched in March 2010. Currently, Pinterest is invitation only (I have invites, so comment below or email me if you’d like one). It has been growing like crazy, so it’s worth checking out. For me, Pinterest solves a critical pain point. Keeping track of the latest technology, communications, and social media trends and stats is one of my biggest challenges. I couldn’t settle on a simple way to keep relevant ideas together in an orderly way. I needed something that was easy to scan and search, was fast to create, and that I could share with clients. Spreadsheets and Word docs were cumbersome, and not easily shared. Evernote captures info with a click and its search feature is amazing – it even searches the text of images. But it’s not very social. And then I discovered Pinterest. Most of the users (apparently) are women, and this virtual pinboard is used to create image collections around shopping, food, and art. Popular uses include planning a wedding, decorating your home, and swapping food ideas. Retail marketers should be paying close attention. Here’s how it works: Start a board about a topic of interest, download the Pin It bookmarklet, surf the web, pin images of items that you find interesting. Once pinned, the image retains the original link, so you can easily surf back to the source. Because it’s visual, it’s easy to scan board items and keep track of things you care about. I’ve adapted my boards to business use: I’ve started boards to track trends and stats, books I recommend, and my favorite websites for monitoring innovation and future thinking. 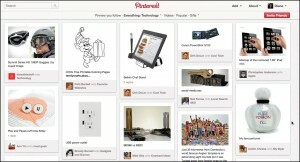 I think Pinterest has huge marketing potential for retailers, small businesses, and B2B. Wedding planners could use it to help brides evaluate catering and flower options, for example. For B2B, it’s a great way to collect and share thought leadership. I know it appeals to women, but honestly, can’t you see this as the perfect place to run your fantasy baseball league? Definitely one to follow in 2012. Diane Thieke is trying to find a way to pin her hopes to Pinterest. Email her if you’d like an invite to Pinterest.